DES MOINES – The Iowa Barnstormers have signed defensive lineman Collin Bevins to the 2019 roster, Head Coach Dixie Wooten announced today. 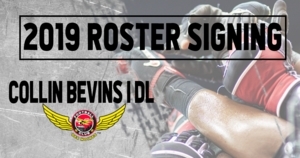 Bevins (6-4, 275, Northwest Missouri State), a native of Creston, Iowa, joins the Barnstormers for his first season in the Indoor Football League (IFL). Bevins began his collegiate career as a redshirt freshman at Iowa State University before transferring to Northwest Missouri University. Bevins had an impressive career with the Bearcats appearing in 52 total games over the course of four years. During his time at Northwest Missouri, Bevins collected 168 total tackles, 58.5 tackles for loss, and 34 sacks. Throughout his collegiate career, Bevins racked up several honors including Third Team All-MIAA during his sophomore season; First Team AP Little All-America, Second Team CCA, MIAA Co-Defensive Player of the Year, and First Team All-MIA during his junior season; and First Team AFCA, First Team AP, First Team D2CCA, and First Team All-MIAA his senior season. In 2018, the Cleveland Browns signed Bevins to a futures deal. Season Tickets for the Iowa Barnstormers 2019 season are available now! For as low as $80 per seat, fans can enjoy the action from the same great seat location each game. For more information, call the Barnstormers at (515) 633-2255 or log on to www.theiowabarnstormers.com.